Last night during Robyn's (My Pink Stamper) live chat, she issued a challenge from Christina (Creations With Christina). The challenge was to use a Christmas image from any Cricut cartridge in a nontraditional way. I used the present from Christmas Cheer to make a birthday card. The paper is Basic Grey and the ribbon is yarn that I got at Big Lots for $1!! I made these hot cocoa slider cards using instructions from My Pink Stamper. A video how-to can be found on her website http://www.mypinkstamper.com/ The paper is Basic Grey Figgy Pudding. I used Christmas Cheer for the Christmas tree. The paper is Basic Grey Figgy Pudding, and the snowflake is from the Cricut cartridge Winter Woodland - my new favorite cart!!! Check out this awesome chance to win a Cricut GYPSY!!! I serve with the most amazing women at my church!! Every couple of months we have an "out of the box event" where we do something outside of work to have fun and build our team. This week it was at my house, and I designed calendars for us to make. I love how everyone took my basic outline and created their own personalized calendars! I used Cricut Plantin Schoolbook cart with Design Studio for the calendar names. I used lots of other Cricut carts for the embellishments! We had a blast working and crafting together! Here are more calendar pages! Week four of this fabulous giveaway from Provo Craft! This looks like a wonderful cartridge! Here is my calendar page for September. I love pink and brown! I have always loved the combination of pink and brown. I am so glad this combo is back in style - it's so easy to get coordinating paper. The brown cardstock is Papertrey Ink. The ribbon is also Papertrey Ink. The heart is from K&Co. Berry Sweet. I used the new Simply Sweet Cricut cartridge for the heart. I finished it off with Prima flowers. I even pulled out my Cuttlebug and embossed on the pink paper. It's kind of hard to see on the picture, but I used alabaster ink around the brown paper and for the sentiment. I adore this new cartridge! I am making gifts for a get together next week using this cart. I'll post pics after the party. I made a set of monogrammed gift cards for my friends on the children's team at church. We have a blast serving God together. Each set has six cards. I boxed the cards in clear boxes that I got at Papertrey Ink. The paper is K & Co. Berry Sweet. I used the Cricut Hello Kitty cart for the cute flower monogram. Wow - We just got back from our week in Boulder, Colorado. The day we left, it was 105 degrees in Norman. That evening in Boulder, it was 75 degrees! We had great weather the entire week with the high on the hottest day being 90. The scenery is stunning and we had the best family time just relaxing and being together. We also visited an Archiver's Scrapbooking store. It was amazing. It is probably a good thing there is not one very close to us here - I would be BROKE! Okay, this is totally amazing. All of the pieces are cut out by hand. There are over 420 pieces! Each flower has 6 petals and there is one circle underneath to hold the petals together. I think she did a fabulous job! She also decorated her portable DVD player using the Cricut. The Cuttlebug Spot is offering a $1000 prize! Click the link below and check it out! This blog has some neat ideas on it! They also do some interesting challenges. Here are some thank you cards using K & Company's Berry Sweet paper. The solid colors are from Papertrey Ink. The stamps are also from Papertrey Ink. The dragonfly is from the Doodlecharms Cricut cartridge! My sweet sister stamped these images for me so that I could try her Copic markers. They are absolutely adorable. I am going to use them in cards sometime this week. As for the Copic markers, they are really cool. I bought a few, and I am not totally convinced that I need more. I don't do a lot of stamping like this, but I do like the look! She is really into them and plans on adding more to her collection as she can. We are going to see my favorite podcasters, Pottercast, in Tulsa!! I am so excited. I'm sure Randy and Shelby will be bored, but I am so glad they are going with me. This card uses Beyond Birthdays from the Cricut cartridge. It seems like forever since I have had time to sit down and create! I made a few signs for our VBX, but I have not made a scrapbook page or card since the Swarm on May 16! It has been a very stressful and exciting time for me in my work life, and I feel I can barely get the necessities done every day. I WILL CREATE something fun this weekend. That is a promise!! We really do have the sweetest dog ever. He likes to be wherever I am in the house. This is where he likes to be when I am crafting. It's funny though, he won't sit here when I am working. I guess my pounding the keys makes too much noise for him. He is kinda in the way when he does this, but it is very sweet that he wants to be with me. After I get up for about the seventh time, he will move to the hall and lie across the door. I guess he figures that is the next best thing! 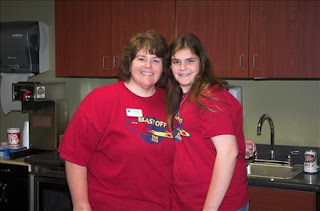 Shelby and I had the privledge of serving together at our church's VBX. We had 705 kids attend this week-long event. Shelby and I were on the hospitality team. We served breakfast and snacks to the volunteers. It was a lot of work, but lots of fun! Here are my thank you cards for May. The paper is from BoBunny. The word "Smile" is from the Wild Card cartridge. I put most of these together at the Cricut Swarm. 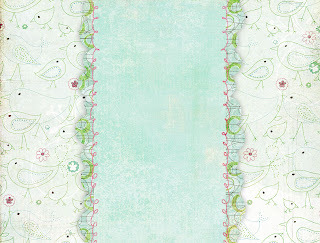 The fifth challenge is to create a scrapbook page using a Scrapbook Sketch Layout. Here is Shelby's page - She used a picture from our trip to New York last summer. Challenge #4 is making a Mother's Day Card. Here's Shelbys card - I tried not to look!!! Here is my first Challenge on The Pink Stampers National Scrapbook Day challenge. Shelby and I are having a blast working on the challenges together! I made my March thank you notes using the Friends paper stack. The flowers are Primas and the fibers are Making Memories Funky Fibers. I made the tag using the Cricut Storybook cartridge. I made this card for my sweet niece, Samantha. She loves frogs! I used Paper Doll Dress Up for the frog and Beyond Birthdays for the hugs to you. Here is my calendar for August! The flowers are from Cricut's George & Basic shapes. I used a Prima flower on the top. The letters are Plantin Schoolbook. This great stack of paper I purchased at my LSS during the Cricut Swarm. The paper is so cute and really great for spring and summer.